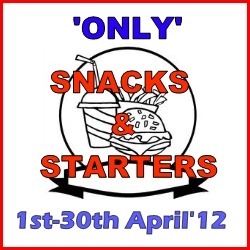 1.The event runs for a period of one month starting from 1st May-31st May 2012. 2.You can submit any recipes starting from starters,main course,soup ,salads,juices,smoothies but no deep frying please. 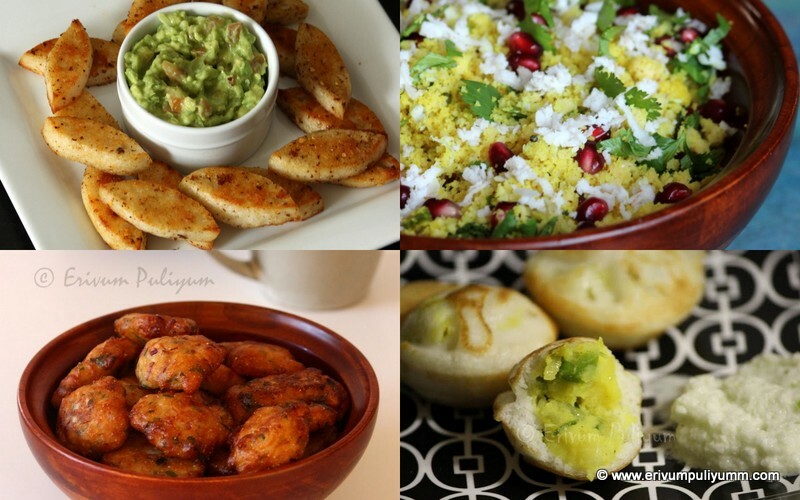 3.The recipe /ingredient should be an iron rich source since the theme "Iron Rich Foods".You can pick the ingredients from the above listed list or any others too.Put on your innovative caps and come out with lovely ideas.Two archived entries are allowed. 5.Use of logo is appreciated as it helps spread the word. 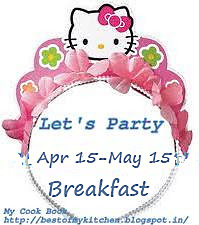 6.Recipes must be linked to Sangee's HITS announcement page and my page here. 7.Multiple new entries are accepted.Only two archived entries are allowed as long as they are linked with both announcements. So,whats stopping now??? 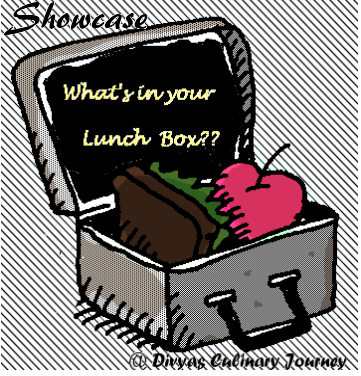 Rush in your edible entries asap to the linky below.All the very Best!! 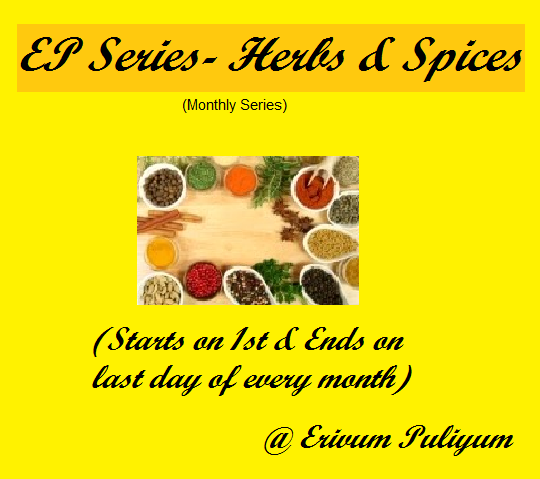 I also would like to thank Surabhi @ My Cook Book for hosting the April Series with 'Mint & Coriander seeds',the round up of which is awaiting.Do drop by her space for the round up and will be updated in my calendar page too soon.A big thanx to all those who have contributed so far in the 2 series and looking forward for healthy,relishing and interesting recipes with the upcoming herbs & spices!! Soya chunks became part of our family after my mom successfully tested this very recipe during one of our lent period(abstinence from non veg items) and after looking at the glimpse of the dish, we all just gave a scream thinking its a non veg recipe in our lent and wondered what's gone wrong with mom.And still mom kept her silence...me & my sis were eagerly craving for chicken those days(that happens with me always when you say not to eat this/not to do that,we crave for that more,Isn't it??) we just gobbled up few of these and then sipped in a glass of water,ah..I still remember it as chicken,but only later did I come to know the wonder vegan meat was soya chunks and that's how this became part of our menu more during the lent period.So,friends enjoy this proteinicious healthy stir fry with rice or as snack.!! 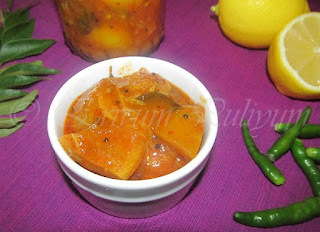 -Cook the soya chunks in water for 10 mins on medium heat with salt and turmeric powder. -Drain the water and squeeze out the excess water.Keep aside. -Prepare the marination and check salt as soya is cooked with salt,only add salt to the spices. -Coat the soya chunks in it evenly and leave aside for 30 minutes. -Heat half of the oil mentioned in a non stick pan and fry the coated chunks both sides till brown.Drain on a paper towel. -Repeat the next batch with remaining oil.Drain on a paper towel and serve hot! * You can adjust the spice flavors as per your spice tolerance. * This can be deep fried too.The oil consumption is more though I shallow fried it too. Pancakes,another varied and easy breakfast loved by all.But majority of the pancakes are prepared using the all purpose flour when you eat out.The same when you prepare at home you can make it a bit more healthier and tastier by adding fresh fruits into it.I usually love incorporating fresh fruits in baking or while making pancakes too.I had tried the Modified Pancake with coconut filling,Plantain pancake and this time for a change just roughly chopped round slices of blackberries and here it goes for an easy n yummy breakfast!! -Take a wide mixing bowl,whisk the egg in it.Add the flour,baking powder,salt & sugar.Mix well with water without lumps like the dosa batter. 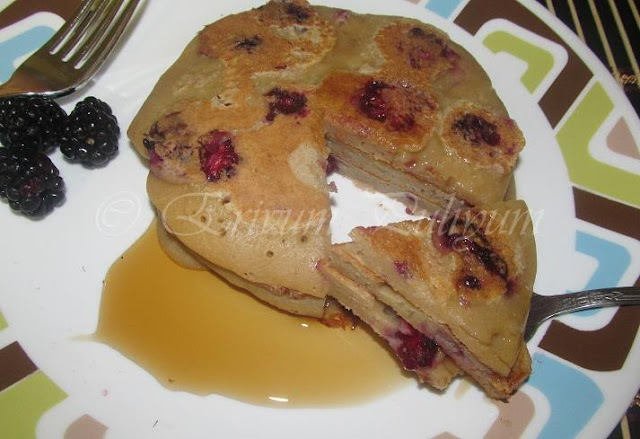 -Add a pinch of baking soda and fold in the chopped black berries. -Heat a non stick pan on medium heat and when it becomes hot ,pour a ladle of batter and spread it in a proper round shape gently. -Let it cook for 2 minutes and then flip the other side and cook well. 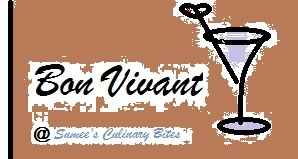 -Remove from flame and serve on a plate. 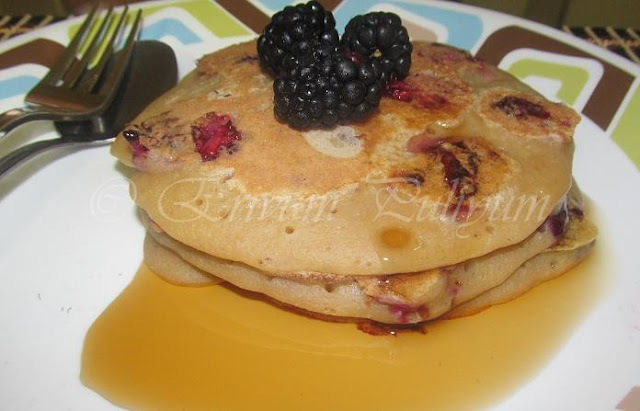 -Wipe the non stick pan with a kitchen towel if there are any fruit residue sticking to the pan. -Repeat the same with the other pancakes. -Serve with maple syrup and enjoy !! * Don't make it very sweet ,otherwise you may not enjoy. * You can try the same by replacing it with other fruits. 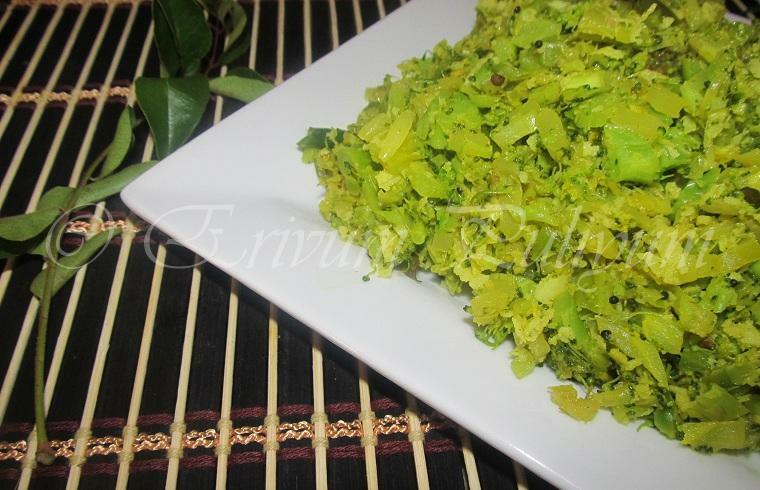 -Wash the broccoli in warm water and add little salt.Leave for 5 minutes,remove from water and chop it very small. 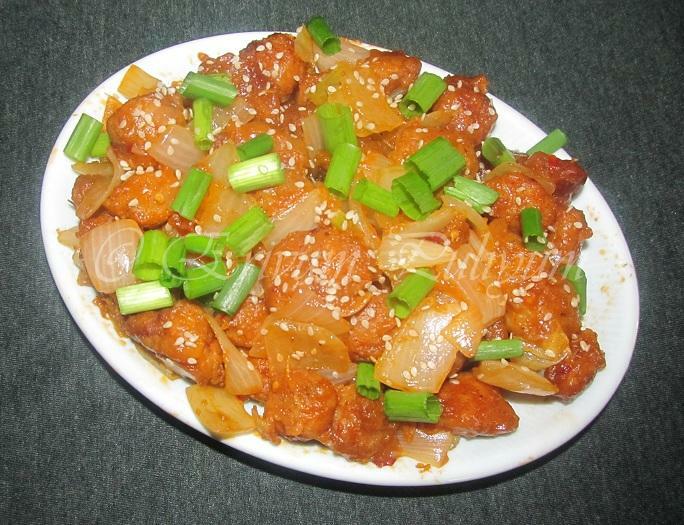 -Peel, wash and chop onion, garlic and ginger.Make a paste of ginger garlic.Wash and cut green chillies,Keep aside. -Pulse the coconut ,shallots and cumin seeds thrice in a blender to get a coarse mixture without adding water. -Heat oil in a pan and splutter mustard seeds. -Saute onion and add curry leaves.Keep stirring till translucent. -Add the green chillies,saute.Add the ginger garlic paste.Saute till raw smell disappears. -Add the chopped broccoli in it and give a quick toss.Add turmeric powder,stir once again.Cover and cook for 7-10 minutes on medium heat. 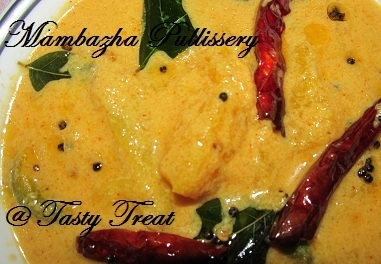 -Check if cooked,add the coarsely ground coconut mix and salt.Cook again for 5mins. -Open the lid,toss and stir fry till the moisture content disappears. 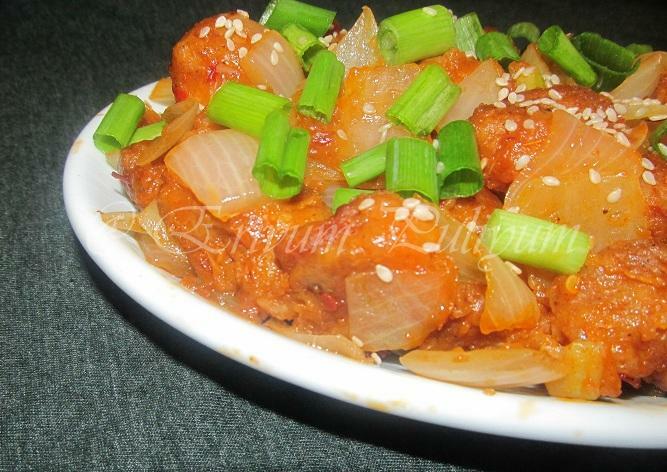 *You can use the same method and prepare the cauliflower florets too. Pizza,as you all know another versatile food loved by all can be made with a wide range of toppings.My first attempt in making pizza was the Apple Pizza,a great dessert or snacker esp for kidoos.This time I planned a savory pizza and so mushroom was my first choice.Then,thought to add these little cubes of tofu too.Tofu was not very familiar to me and so googled up to find these bits which might be helpful to some of my bloggers as well before buying.Tofu looks similar to paneer/Indian cottage cheese and is made by coagulating soy milk and then pressing the resulting curds into soft white blocks.Widely used in East Asian and South East cuisines.I was using tofu for the first time and it has a subtle flavor.It can be used for sweet and savory dishes.Tofu has low calorie count and very high protein and low fat unlike paneer/cottage cheese.Depending on the coagulant used,tofu can be rich in calcium or magnesium too.That's how I ended up buying tofu and preparing the pizza out of it.Pizza turned out very good and as always home made one with wheat flour is very filling & healthy as well.I used the store brought Pizza sauce,you can use your desired one..Check this out !! -Add the yeast in warm water along with sugar and stir.Keep aside for 10 minutes until it starts frothing. -Sift the flour in a bowl ,add salt .Sift again.Add the olive oil and yeast mixture and knead with hands to form a dough. -Knead the dough smothly,place it in a covered bowl and leave to rise for 1 hour. -Punch out the air and knead again,leave aside for 45 minutes. 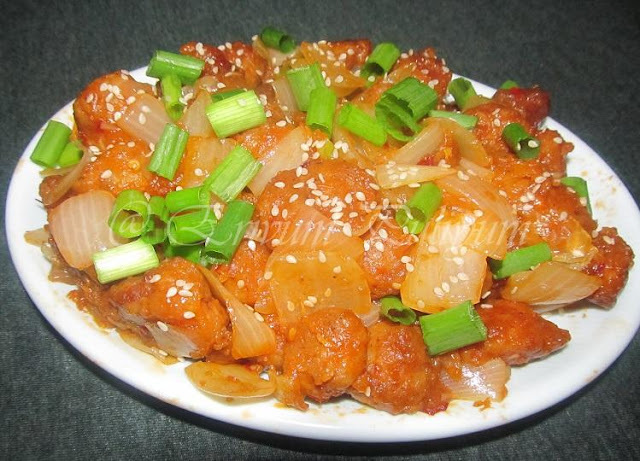 -In the mean time,prepare the topping.Heat oil in a non stick pan preferably and shallow fry the tofu cubes till its slightly browned on all sides.Add half of the pepper powder and salt.Remove on a plate with paper towel.Divide the fried tofu into 2. -Add the sliced mushrooms & garlic in the same oil and saute till the water starts leaving from mushrooms and it changes color when cooked.Add the remaining pepper powder and salt.Put off flame.Cool it down and divide into 2 equal portions. 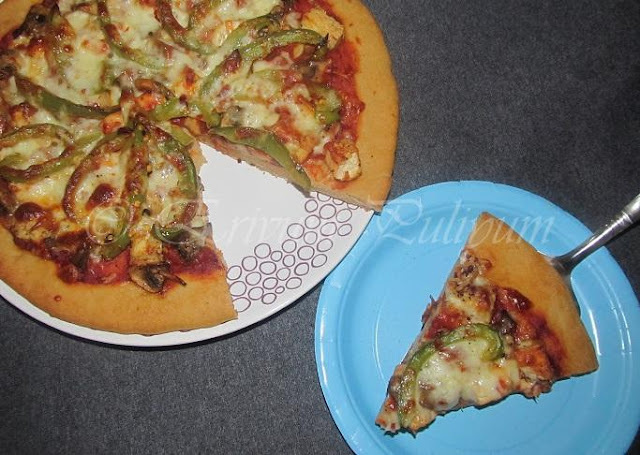 -Preheat oven to 425 degrees F.Prepare a pizza pan by smearing oil at the base and adding little bread crumbs on it so that the dough doesn't stick and easily moves. -Roll out the dough on a clean flat surface after dusting little flour to a diameter of 10" and 1/4" thickness.Transfer it into the pizza pan. -Prick with a fork in between the rolled base.Top it up with the pizza sauce evenly and add the first part of cooked mushrooms and first part of tofu on top.Add the thinly sliced bell pepper & pizza seasoning.Finally finish off with grated mozarella cheese,parmesan cheese to garnish. -Brush the left over sides of pizza base with olive oil ,gives a nice color. -Place it in the oven and bake for 16-20 minutes and remove from oven. 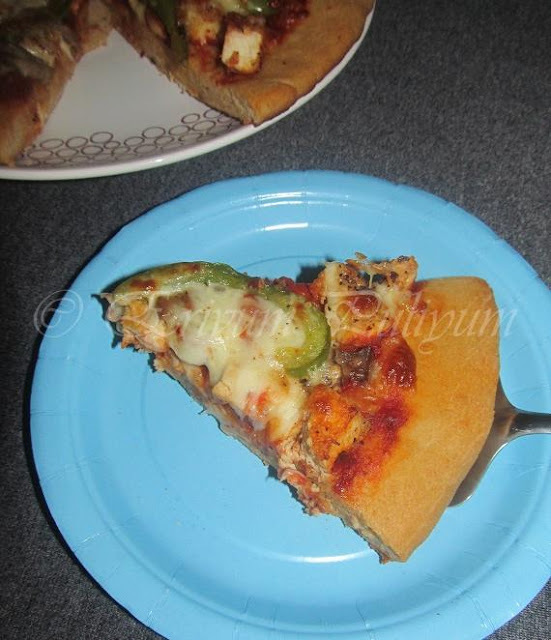 -Repeat the same with the other part of the dough and use the reserved toppings. -Remove from oven and cool a bit ,cut into pieces and serve with tea or as brunch /dinner!! *The topping mentioned is for 2 pizzas,please adjust the ratio if you're making only one. 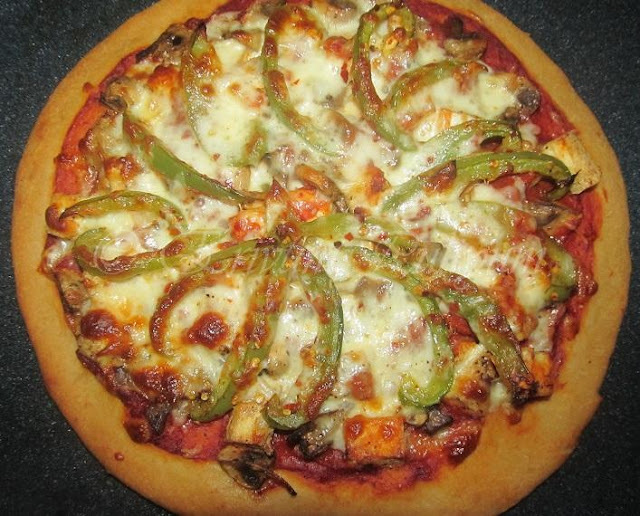 * If you are fond of thinner crust,roll out the crust really thin. * If you want a pizza thick ,then use the whole dough and roll out to make one. 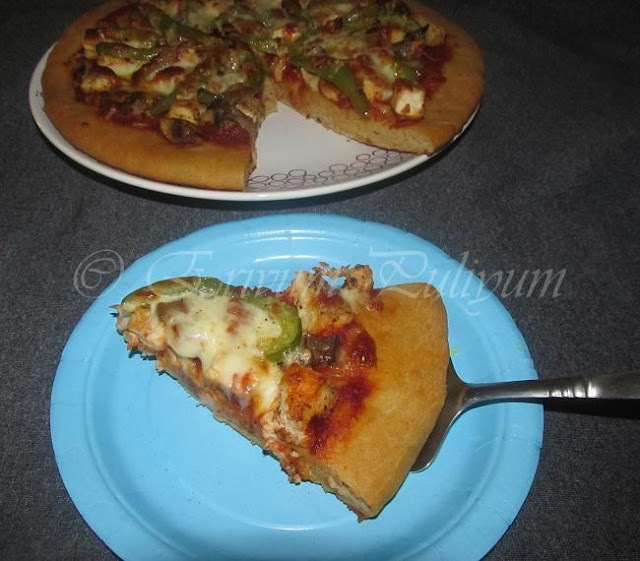 * You can add tomato slices instead of bell pepper slices. 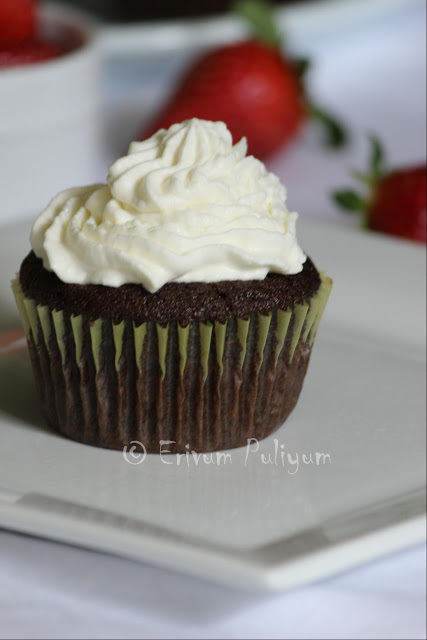 * You can also try your desired topping keeping the base recipe same. * The shallow fried tofu and mushroom can be seasoned with italian herbs. * Half of the dough can be refrigerated if covered with a cling wrap and can be used later within a week. -Soak urad dal in water for 4-5 hours and grind it in a mixer or blender into a smooth paste with very little water or no water if possible.Transfer the batter to a bowl and using your hands beat the batter several times(3-4mins) so as to aerate the batter,which will make the vadas soft.Keep aside for 30-45mins. -In the meantime,clean,wash and chop the shallots.green chilllies,ginger to small bits and add it to the batter. 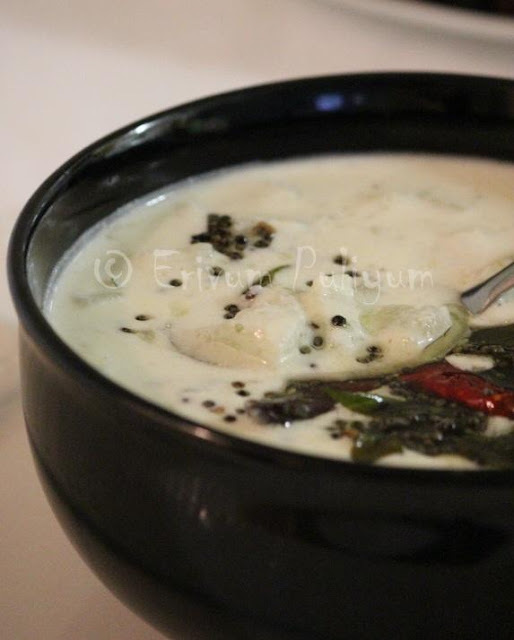 -Add salt and peppercorns,torn bits of curry leaves in the batter and mix well. 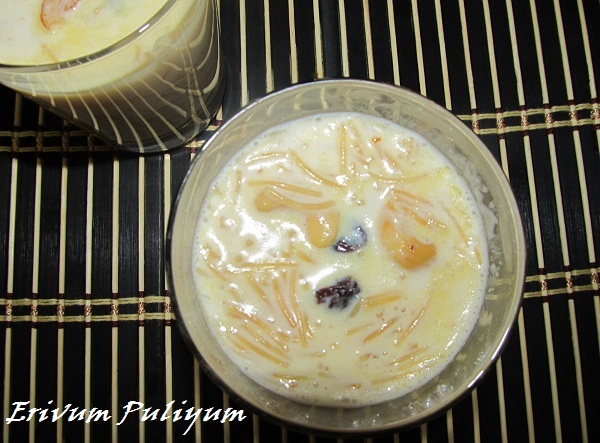 -Add the rice flour and mix well just before frying. -In the meantime,heat oil in a wok on medium heat and let it become hot.Check the oil by dropping a small portion of the batter,if it sizzles and rises up,the oil is ready to fry. -Slip it into the hot oil and wait till you see bubbles and sizzling sound subsides a bit.Then flip the other side and deep fry both sides till golden brown. -Wash the mint leaves ,green chillies and chop small,Peel the shallots,wash and keep aside. -Blend the coconut and all other ingredients except salt and grind to a coarse paste. -Add salt now and grind again for 1minute. 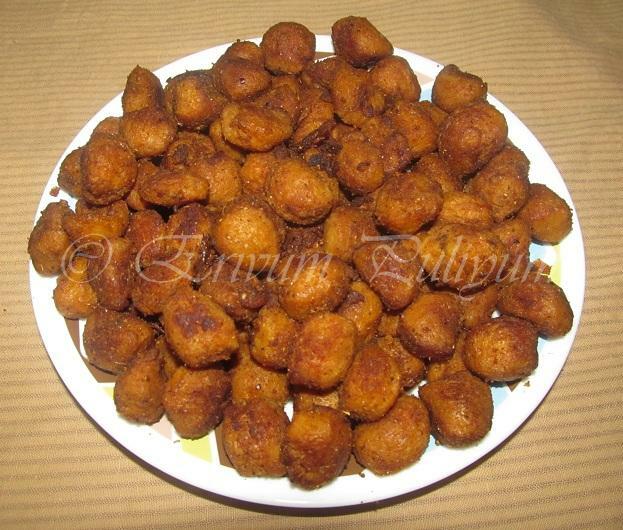 -Remove from blender and serve with vadas. 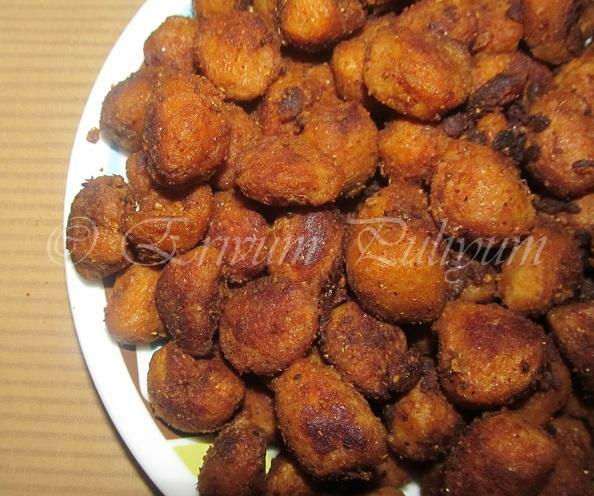 * Adding rice flour adds crispiness to vadas.Don't add to much otherwise the vadas will turn hard.You can even add few teaspoons of urad dal powder if your batter becomes a little loose and doesn't hold shape. 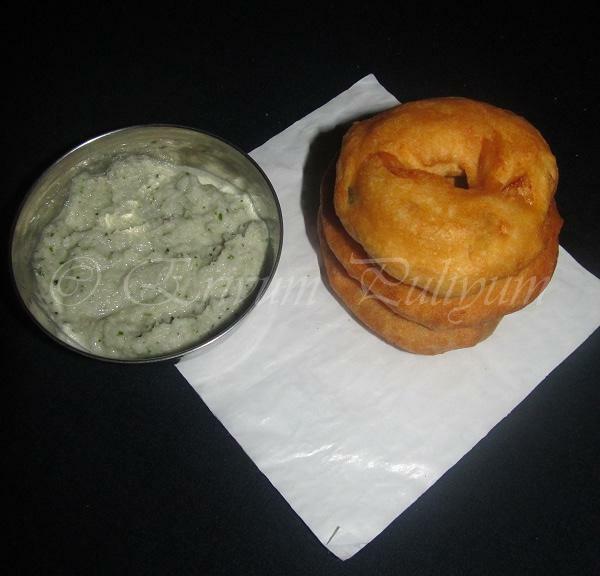 * Don't slip the vadas into the oil unless the oil is hot enough.Wait till the bubbles subside and the vada has lightly become crunchy at the bottom side to flip it the other side,otherwise it may not hold shape. * You can use a banana leaf too instead of palm to shape the vadas. 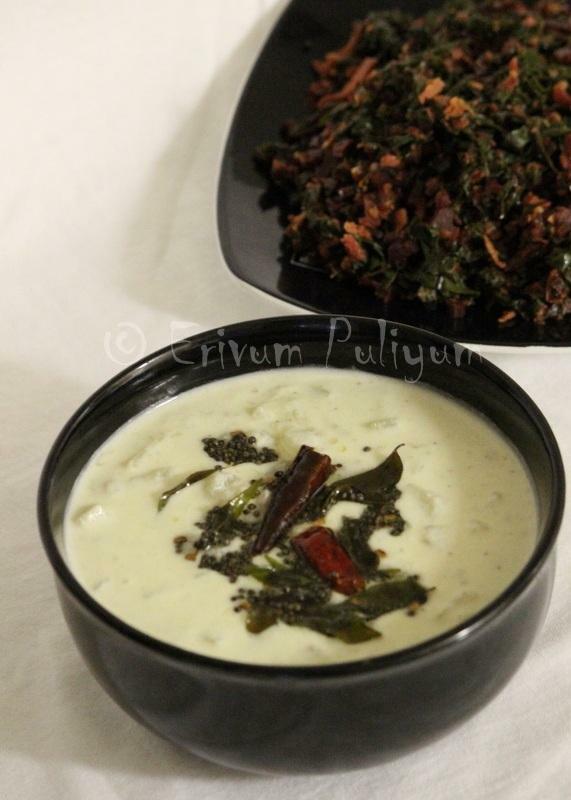 * Adding mint leaves to the chutney is optional.You can omit that and prepare the regular coconut chutney. 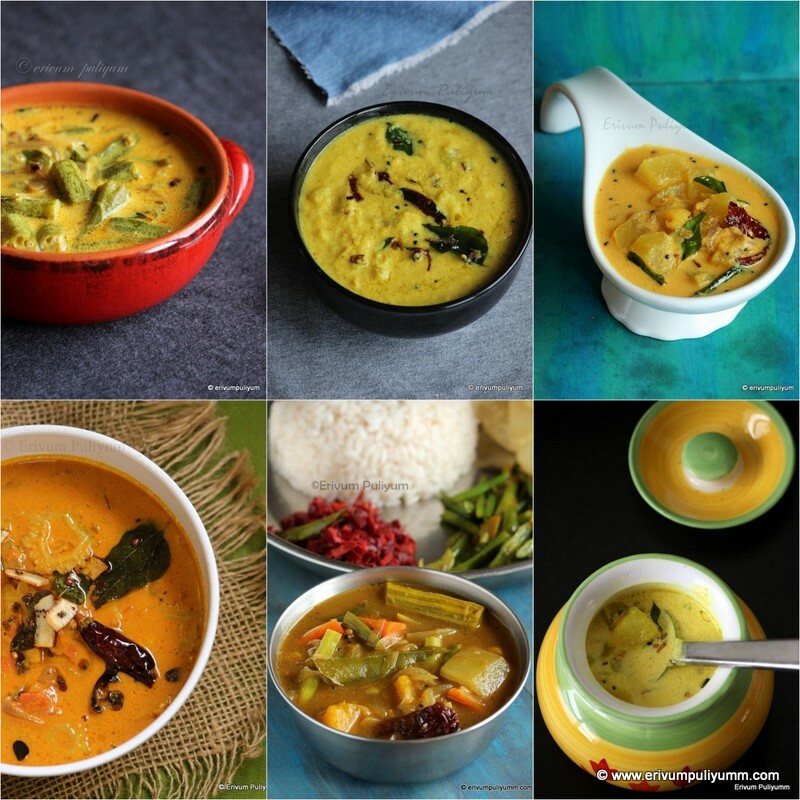 * The chutney should be thicker in consistency unlike the chutneys for dosas. -Boil a potato with little salt in a pressure cooker or microwave.Mash and keep aside.If you prefer hash brown potatoes,you can do it that way by stir frying the shredded potato. -Heat a kadai/wok on medium heat and add half a tbsp of butter in it.Saute the chopped onions and spinach till cooked and translucent.Put off flame and cool it. -In the mean time beat eggs until fluffy and stir in salt and pepper powder. -Add in the cooked onion and spinach. 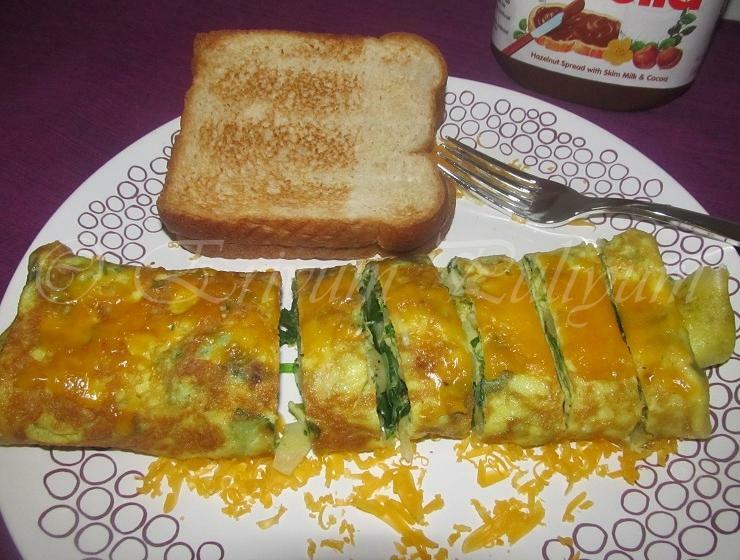 -Melt the other half of butter in a nonstick pan of atleast 12 " wide and swirl the beaten egg mixture into the pan and evenly distribute the onions and spinach using a spatula. 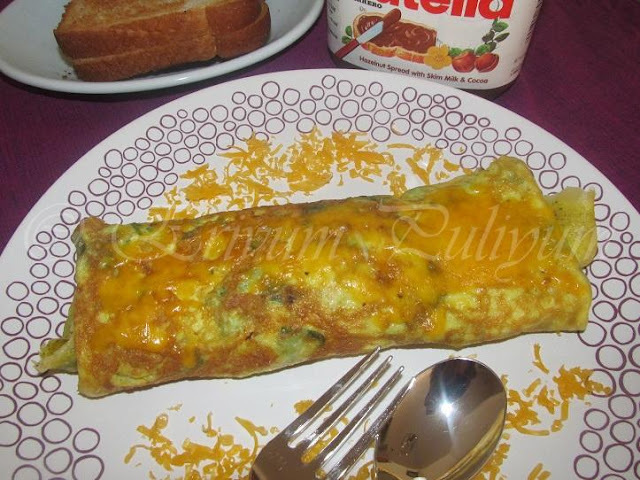 -Cook for 4-6 minutes on medium heat or until the top of the omelette is firm. 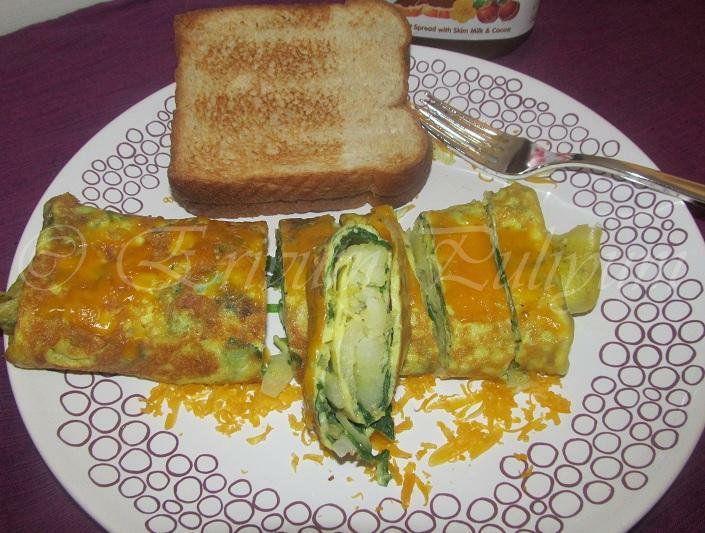 -Fold in the top and bottom of the omelette one inch. -Arrange the potatoes on top of the cheese and start folding over the filled ingredients,till you reach the end. -Transfer it to an oven safe plate/tray and sprinkle the cheese on top. -Pre heat oven to 300 degrees F and place the plate in the oven for 2-3minutes until the cheese melts. -Remove and serve with the sour cream garnish if desired. 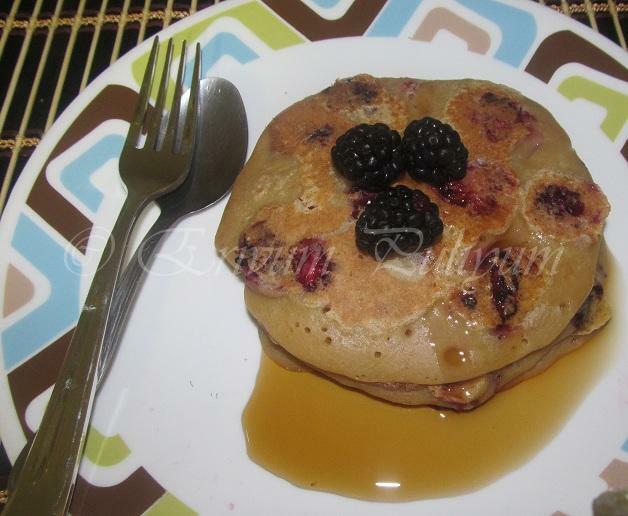 * You can add a tsp of pancake mix to the batter to make it more fluffy .I haven't done that. * The hash brown potatoes are pan fried potatoes after being shredded or julienned.I have just boiled and mashed one medium sized potato with little salt for a healthier option,you can do as desired. * If you desire a non veg version ,you can add ham or chicken instead of the steps with spinach. *I have not added cheese in the filling just sprinkled on top.You can add it in the filling. *Adding pepper powder is not in the I hop recipe bujt I like the flavor of pepper powder in omelette and so have added.You can omit if you wish. - Clean the prawns by rubbing salt and lime,keep for 10-15minutes. -Wash under running water and marinate using the marination ingredients.Keep for 30-45 minutes. 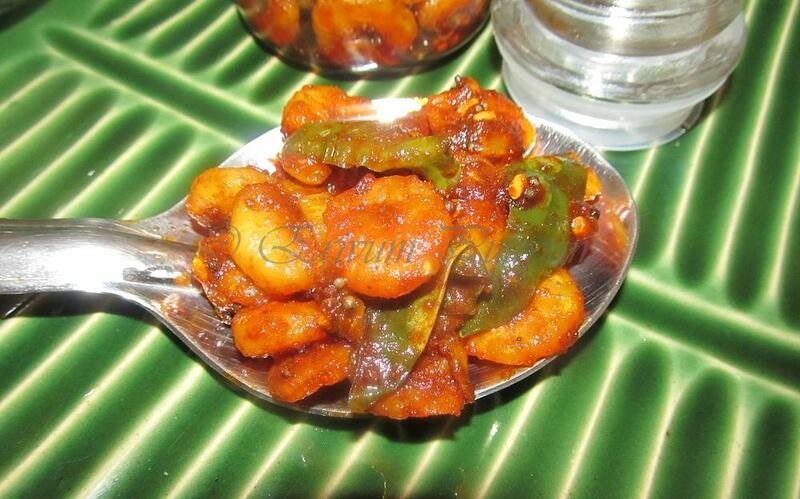 -Remove from oven & heat oil in a pan and shallow fry the prawns.Keep aside in a plate. -Splutter mustard seeds and fenugreek seeds, add curry leaves. -Saute the sliced ginger ,garlic & green chillies. -Then,add the chilly powder on low flame ,turmeric powder .Slide in the prawns & mix well. Put off the flame and add vinegar. 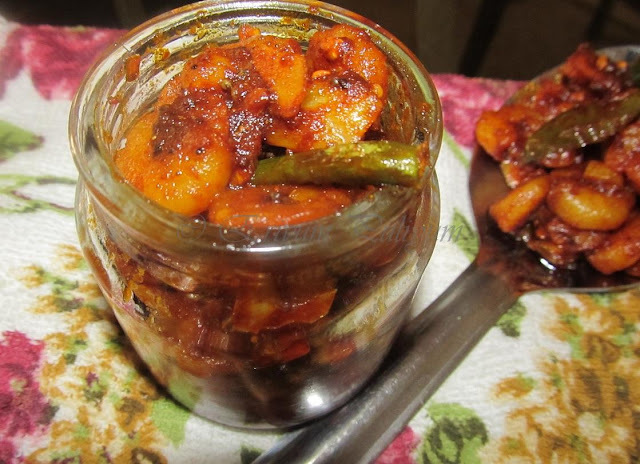 -Tasty chemmeen /Prawns pickle is ready .Keep for 2-3 days undisturbed and then use it. * I used the small shrimp and used frozen packet . * You can use any other oil too if you are not preserving for long. * This is a dry version .You can increase the oil or vinegar to increase the gravy. * If you want to omit the baking step then, deep fry the prawns before pickling. * The oil should be preferably gingelly oil if you plan to preserve longer.I knew my family and so have used olive oil only as it had a shelf life of just one week.Usage of oil can be modified in your own way,increase if you're deep frying and also if preserving longer. Cook the soya chunks with water and salt or pressure cook as per your choice till soft and tender.Remove from fire and then squeeze the excess water.Keep aside. 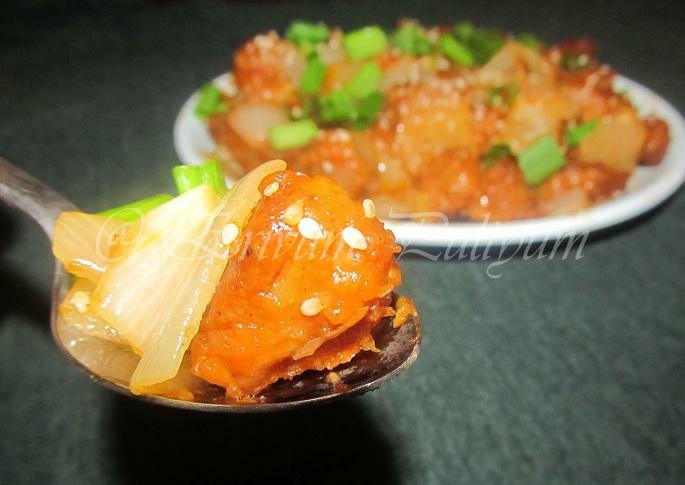 Marinate the soya chunks with the marination ingredients and keep it in for 1/2-1 hour. 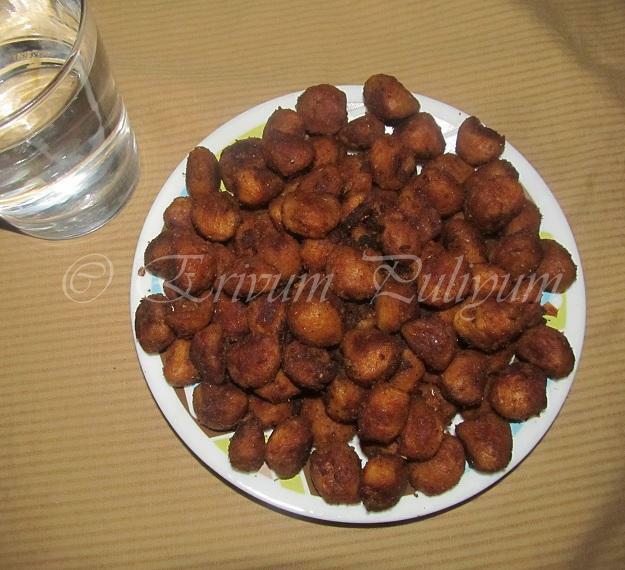 Heat oil in a skillet and shallow fry the soya chunks on medium heat,till light brown .Place it on paper towel. Saute the ginger garlic paste till the raw smell vanishes,Add the cubed onion and saute till transparent. Saute for a minute and add all the sauces listed. Mix the fried soya chunks pieces to it. Mix the corn flour in 2tsp of water and add to the mix. The gravy thickens,adjust salt and garnish with chopped spring onion and sesame seeds. * You can add a capsicum too along with cubed onion. * Adding sesame seeds is optional. * Increase water to the cornflour mix if you wish to have more gravy and remove from flame immediately. "HAPPY VISHU TO ALL "
Vishu & Onam are two occassions in Kerala where you find the traditional vegetarian sadya dishes.Though we don't celebrate Vishu at home but sadya dishes are always inviting ones.Vishu is a festival of feasting,wearing new clothes,setting off fire crackers and elders gift money to kids,servants and other tenants known as Vishu kaineetam.The other important part of Vishu is the Vishu kanni(the first thing seen on the day after waking up)The usual ritual is the arrangement with the raw rice,vegetables,fresh fruits,flowers mainly konna, mirror,ritual book,coins and pooja lamps.I have done the arrangements of Vishukanni with my friends who celebrated Vishu during hostel days..Anyways,coming back to Today's recipe is a simple pachadi/kichadi with winter melon.This is an important side dish of sadya and so sharing with all !! 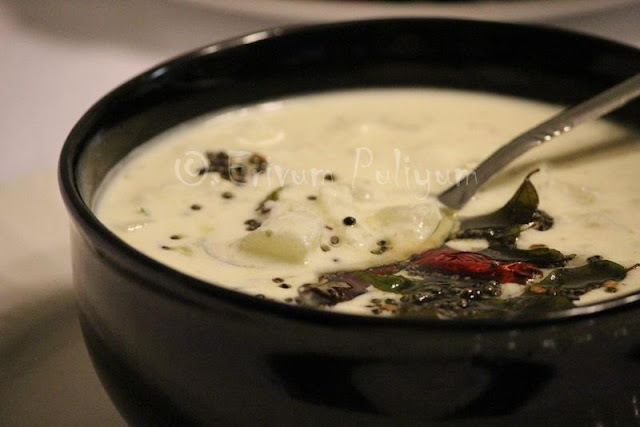 -Grind the coconut,green chillies,ginger and mustard seeds to a fine paste. 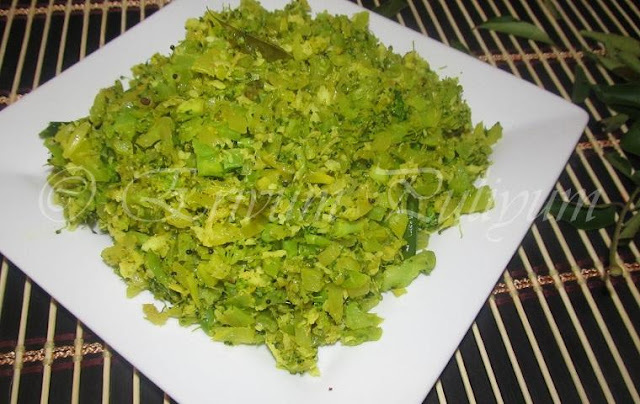 -Cook the melon with green chillies(vertical slit)little salt and water in a wok. (It takes approx 10 minutes)Turn off flame and let it cool. -Add the ground paste to it and put on low flame. -Add this to the melon cooked on low flame and just heat it.Put off flame and remove. -Heat oil in a non stick pan and splutter mustard seeds,followed by red chillies,curry leaves. 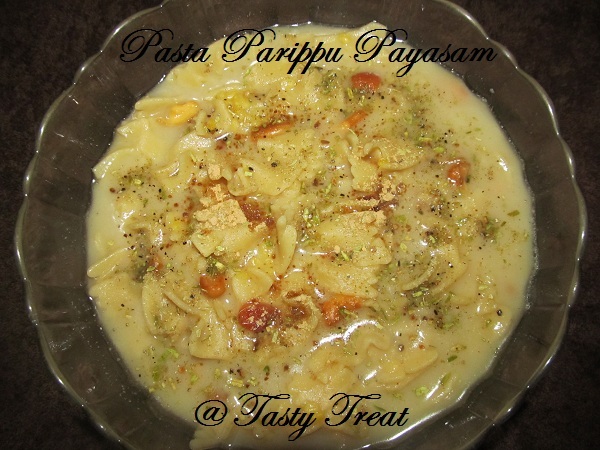 -Add this to the pachadi and mix.Serve as a side dish with rice.